Single, double and triple glazed dome options in clear polycarbonate and available for fixing directly to a builders upstand. This direct fix option is pre-drilled to aid installation and the glazing unit is supplied pre-drilled and with all tapes applied and comes with a fixing kit containing tamper proof security fixings. Measure overall dimensions of the opening and builders kerb (length x width). Standard dome sizes are show above. Triple glazed Mardome rooflights achieve a U-value of 1.8 W/m²K and comply with the requirements of Part L of the Building Regulations. 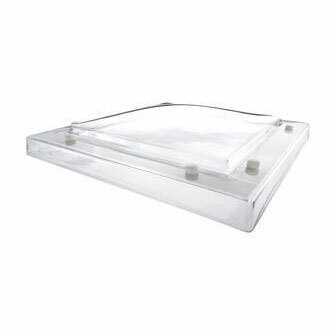 It is recommended to use triple skin rooflights if compliance is a requirement.